A complete set of the six Dark Man Plays continuing the adventures of the Dark Man. The Dark Man series has won great acclaim and awards for its ability to engage older very reluctant readers who have a reading age as low as 5 to 7 years. Each book features the Dark Man, a shadowy, brooding loner who has been recruited to play a part in a secret cataclysmic struggle between good and evil. This new series of plays is in a format suitable for performance and small group readings. The dialogue is presented in small sections and each speaking part is illustrated, to aid group reading. This set of plays are accompanied by two workbook including teachers notes and photocopiable literacy activities.A complete set of the six Dark Man Plays continuing the adventures of the Dark Man. 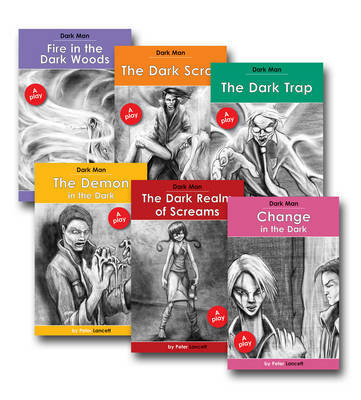 The Dark Man series has won great acclaim and awards for its ability to engage older very reluctant readers who have a reading age as low as 5 to 7 years. Each book features the Dark Man, a shadowy, brooding loner who has been recruited to play a part in a secret cataclysmic struggle between good and evil. This new series of plays is in a format suitable for performance and small group readings. The dialogue is presented in small sections and each speaking part is illustrated, to aid group reading. This set of plays are accompanied by two workbook including teachers notes and photocopiable literacy activities.